Home Marketing Strategy What Makes A Trade Show Table Outstanding? When you take your business to a trade show, you want to make sure you stand out among the crowd. Otherwise, how are potential customers or even investors going to remember your business compared to your competition? Humans are visual creatures by nature, and making your trade show table look its best is key to drawing in new customers. 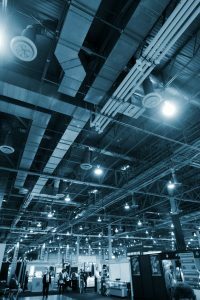 If you want your trade show table to represent you and your company well, here’s what you need to invest in before you get to the show. Visible signage: If people passing your table can’t quickly read your signs, they won’t know who you are. You want any banners or digital displays you have to be visible and easily read so that people passing by quickly process who you are and what you do. Make your fonts large and legible, and display any logos prominently. Promotional items: Who doesn’t love a little free business swag when they go to a trade show? Promotional items not only make your trade show table more visually interesting, but they will also help with brand recognition later on. 71.6% of trade show attendees who received a promotional product remembered the name of the company that gave it to them later. Table throws: This might seem like less of a priority, but table throws are surprisingly important to the presentation of your trade show table. Table throws tie the entire presentation together neatly and can make your space look better put-together, giving your table a sense of professionalism that others might lack. The right staffing: Regardless of what industry you’re working in or what trade show you’re at, having the right people promoting your business and working with the public is key. Make sure anyone at your booth gives a strong and positive impression of the company, so that customers will remember their interactions at your table well. Trade shows can be difficult to navigate, but creating a strong visual presence and having a good first impression can make all the difference when it comes to your trade show table being memorable against competitors. Want more advice on how to take your marketing to the next level, or needing to stock up on promotional items and table throws before your next trade show? Contact Exposyour today for more information.